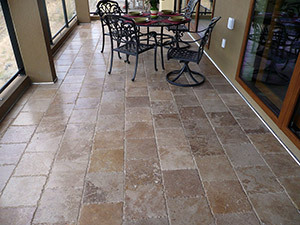 Kenny’s Tile carries and installs travertine landscape pavers for homes in the Kansas City area. Travertine Paver patios will make your back yard a place you can’t wait to get home to adding value, relaxation and a great place to entertain. Unlike poured concrete or stamped concrete, paver patios are gaining in popularity as a way to enhance the value, relaxation and appeal of your home. The possible applications for pavers are only limited by your imagination. Maximize your outdoor living space with a design that is all your own. Create a scenic walkway in a beautiful backyard garden. A variety of hues and textures allow you to have unlimited possibilities to both compliment and enhance the natural beauty of any surrounding while being friendly to the environment. From palatial outdoor entertaining areas to pool decks with a relaxing spa-like feel, you can count on unsurpassed strength and flexibility. Plus, they are especially designed to withstand freeze-thaw conditions, making them a good choice for cool as well as warm climates. Chiseled & tumble travertine Edge Pavers offer a more creative and artistic arrangement to an exterior project such a patio, pool deck or driveway. Chiseled Edge & tumbled travertine pavers are ideal for driveway and patios because they can support much more weight than brick pavers if they are installed with a strong base. Natural stone is also much stronger than man-made concrete pavers. Since it is natural stone, the color will not fade in time and they will last forever, just like the ancient buildings of Europe. There are multiple sizes this product comes in; the most popular look is a French / Versailles pattern which consists of 4 sizes of material: 8x8, 8x16, 16x16 & 16x24. If you are still looking for square shaped pavers, we do have all the colors available in 6x12, 12x12, 16x16 and 24x24 size as well. 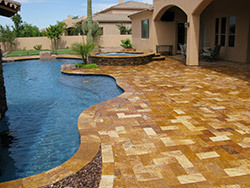 The thickness of the chiseled or tumbled paver is 1 1/4". Available colors are Ivory, Medium, Walnut-Noce, Gold, Silver & Scabas.